Tempered - Glass that has been run through speical ovens at high temperatures. When tempered glass breaks, it breaks into many small pieces. Glass is cut to specific sizes before it is run through the ovens. Once glass has been tempered, it cannot be recut. Laminated - Glass that has been made by adhering a film between two pieces of glass. When laminated glass breaks, many of the pieces often stay together due to the adhesive properties of the inner film layer. Laminated glass can be cut down at any time. Wire Glass - Glass that has been made with an inner layer of metal wire. Like laminated glass, when wire glass breaks, many of the pieces often stay together. Wired glassLaminated glass can be cut down at any time. Glass has been used for building purposes since the 11th century. Plate glass or sheet glass can be used for many things from windows, to shelving, to office partitions, to bullet proof applications, to table tops to name just a few. 1/4" - Often used for table tops, small shelves, shower enclosures, etc. 3/8" - Often used for shelves, table tops, cases, shower enclosures, etc. 1/2" - Often used for shelves, table tops, cases, storefront, etc. Thicker glass can also be used for other special applications as well and is available as a special order. due to it's unsafe nature. Minimally, all glass and mirror is seamed before customer pickup. Glass is typically clear. However, some applications require the glass to be tinted. Usually glass is tinted in either a grey or bronze shade. Tinting can come in darker or lighter shades depending on custom er requirements. Glass can be made in a wide variety of textures and patterns. 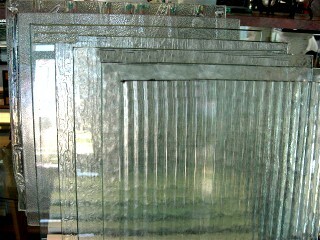 Decorative glass can be used for shower doors/enclosures, table tops, entry door sidelights, etc. Some of our more popular decorative glass include Aquatex, Glue Chip , Pattern 623 and Rain. The sharp corners are ground off. All glass leaves the shop with bumped corners for safety. Corners are cut off with a straight cut per customer's specifications. 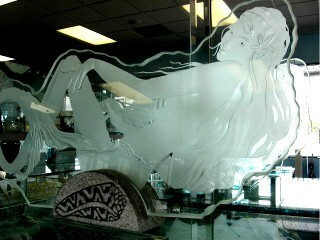 Different patterns and images can be sandblasted or carved onto glass. This can add a unique touch to shower enclosures, cabinet and entry doors, awards, placks and art pieces.